Imagining A Future When The Doctor's Office Is In Your Home : Shots - Health News You can now monitor your heart rhythm with your cellphone. Dr. Eric Topol imagines a day when patients will be doing a lot more of their own medical testing, with doctors as advisers. 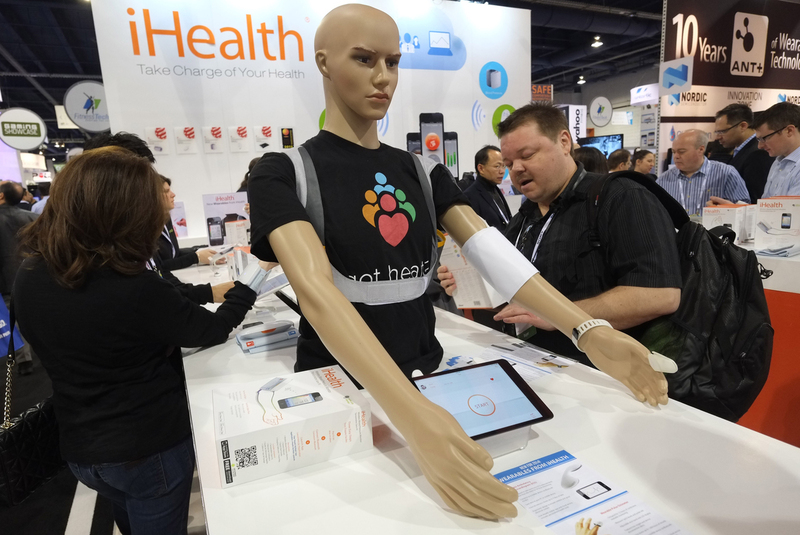 Visitors check out wireless blood pressure monitors at the Consumer Electronics Show in Los Angeles. That's the gist of his new book, The Patient Will See You Now. Lots of people are bullish on the future of mobile health to transform health care, but Topol gets extra cred because of his major medical chops: Former head of cardiology at the Cleveland Clinic and present director of the Scripps Translations Science Institute in La Jolla, Calif.
We caught up with Topol during his book tour to ask him just what mobile, digital health care would be like. Here's an edited version of our conversation. What got you excited about mobile health applications? Back when I was at Cleveland Clinic, in 2000, I was contacted as a cardiologist from a company that wanted to be able to do your heart rhythm monitoring over the Internet. It was the first dedicated digital medical company. I thought that was very exciting. That opened my eyes to oh my gosh, there's a whole new world out there. The initial reaction was that's pretty zany, but there was also some genuine excitement. It wasn't ready yet, but the concept was highly attractive. Now you can have something smaller than a credit card and can get your heart rhythm monitoring through the phone, and it's FDA approved. You can buy it for $69 on Amazon, have it delivered to your door and have your rhythm monitored no matter where you are. You've used that sort of phone-based heart rhythm monitor to diagnose people on airplane flights — twice. Now you're saying that a lot of the testing and monitoring that is done in hospitals would be better done at home. How would that work? The hospital is an edifice we don't need except for intensive care units and the operating room. [Everything else] can be done more safely, more conveniently, more economically in the patient's bedroom. We made this unbelievable switch from inpatient surgery to outpatient, so many operations are done now as an outpatient. So we did adapt. You can now do a stent as an outpatient in an hour. So that's going to happen again. We're going not from inpatient to outpatient but inpatient to home. Hospitals are going to need to become data surveillance centers. The data is going to be coming from the community, from the region. Won't a lot of people be left behind because they can't afford to do this or can't manage the systems? We're talking about cheap stuff; smartphones you can get for $35 now from China. You have a cheap phone, you have mobile signal everywhere, pretty much, and you have very user friendly interfaces. My 93-year-old mother-in-law lives with us and she's on her iPad constantly. It might be cheaper for us to give a smartphone and a service contract to people rather than to have them go to emergency rooms and be hospitalized; one day in the hospital is $4,500 in the U.S. I think the cost of that tradeoff is eventually going to be borne out. There are health care systems like Kaiser with a mobile app where you can access any part of your record, your labs, your chart notes, your hospital records. Organizations that don't share that though a mobile device are not going to make it. Hospitals are not going to be thrilled with losing market share. How are these changes going to come about? It's not going to happen from within the medical community; it has to be from external forces. All the big tech companies are getting into medicine — we have Google, Apple, Facebook, Salesforce.com. But the real innovation isn't coming from them, it's coming from the startups. There's one I love, this UCLA startup, they started this company to do X-rays through your phone. It's the selfie of the future. We have to get the privacy security part cleaned up. And we also have to get the science analytics tuned up. We have to get a lot of validation, clinical trials. A lot of these have not gone though clinical trials; they're just attractive ideas that need to be proven. Where do real live doctors fit into this world? I am a regular cardiologist on Thursday; it's my clinical day, I love that. I'm going to continue to to advance this new model of care which is individualized and modern, but also never discounting the vital aspect of the human factor, human touch. Anyone who knows me as a doctor knows I have really close relations with patients; it's not this computer machine thing. I love practicing medicine and I'm going to continue doing it with that paramount objective.